If you need a sense of hope about the future of democracy, you’ve come to the right place. 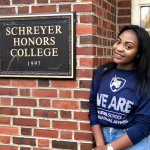 Stephanie Keyaka, editor-in-chief of The Underground and one of the McCourtney Institute’s Nevins Fellows, is spending the summer interning for Zeke Cohen on the Baltimore City Council. She believes Baltimore is on the cusp of something big and is doing everything she can to help bring that change to fruition. Stephanie’s spent her summer canvassing in support of an amendment that will give the council and the city’s residents more control over its budget and answering calls from city residents who are looking for help for problems ranging from the serious to the mundane. During the course of those conversations, she’s had the chance to deliver some optimism about the city’s future. The Underground is an all-digital news platform at Penn State that covers campus and community events through a multicultural lens. Stephanie sees firsthand the power of the free press in a democracy and tries to instill a sense of passion and tenacity in the reporters she oversees. Stephanie, like all of our Nevins Fellows, is extremely bright and very well spoken. It’s hard not to feel at least a little hopeful about the future of democracy with people like her poised to take the reins.